It’s taken a while for us to pursue a reader tip-off about Mumchan. But we know immediately upon entering that this is going to be worthwhile adventure. 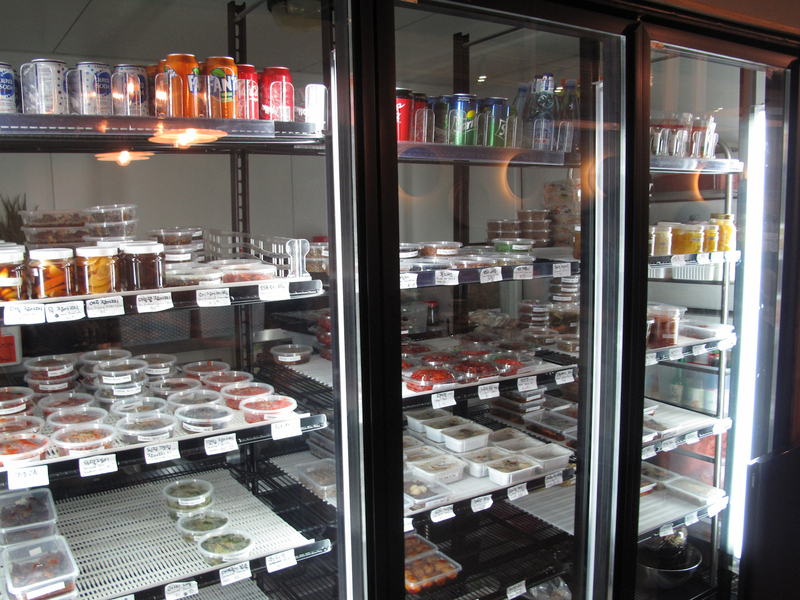 Item: The display fridge is stacked with all sorts of interesting pickles, preserves and more, all set for taking home. And, yes, we take some home. Item: Even at our arranged meeting time of 6.30pm on a Friday, we are obliged to do something CTS rarely does or even considers. Yes, we have to wait for a table. But not too long – besides our dining companions are yet to arrive. We are seated soon after they do. Tonight, Bennie and I are joined by a Team CTS comprising my Star Weekly colleague Maria, her partner Gary and son Matteo. Item: As Gary points out, so chic is Mumchan – but not in an overbearing way – that it looks like it’d be just as home in Seddon, Fitzroy or the CBD. Regular readers will know decor doesn’t feature high on the CTS list of winning factors. But we do enjoy supping in fine surrounds. The big kitchen is mostly open to observation, the staff deal with a busy night with smiling aplomb and the wait times are just right. The menu is studded with dishes familiar to us and many not so. Along with the starters are special dishes, fried chicken to share and lists of rice offerings and stews that appear to be one-person meals. 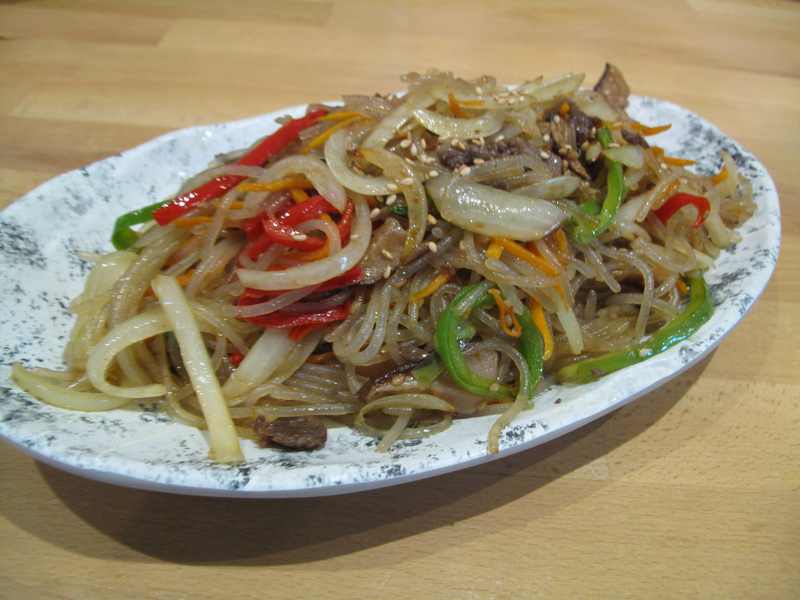 Japchae ($16) is a comforting noodle dish and a tad on the conservative side, chosen – I suspect – by Maria with Matteo in mind. He pretty much ignores it completely, but the rest of us enjoy it. 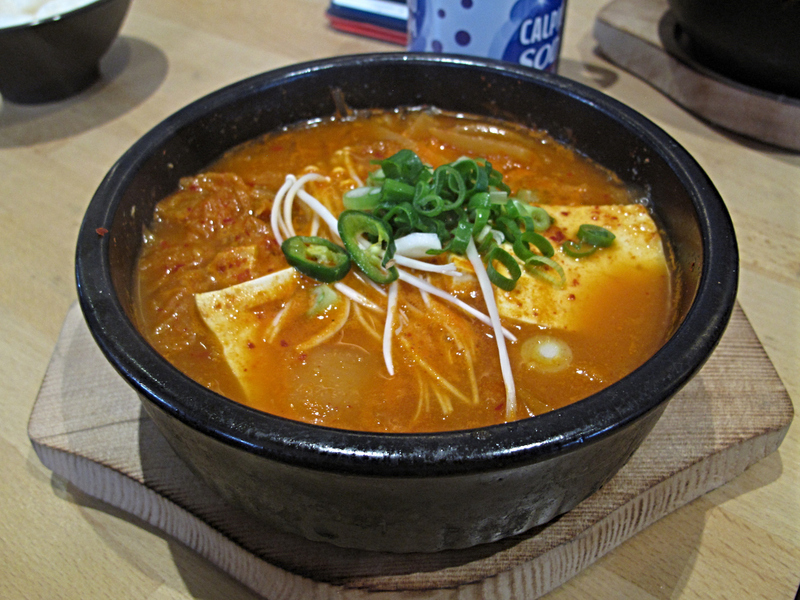 Bennie’s kimchi stew ($14) of kimchi, pork and tofu in spicy broth is fantastic. 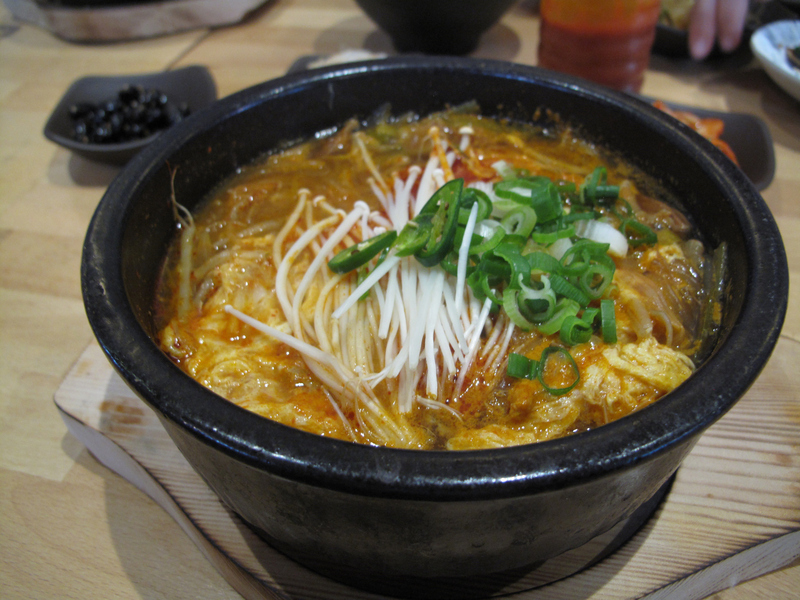 It’s called – according to Korean-loving CTS buddy Justin – kim chi jigae. Even for myself, not a kimchi zealot by any stretch, the soup is tasty and tangy. Bennie tells me the pork cubes frolicking with the tofu and noodles are short of fall-apart, but that their solidity is just right for his dish at hand. 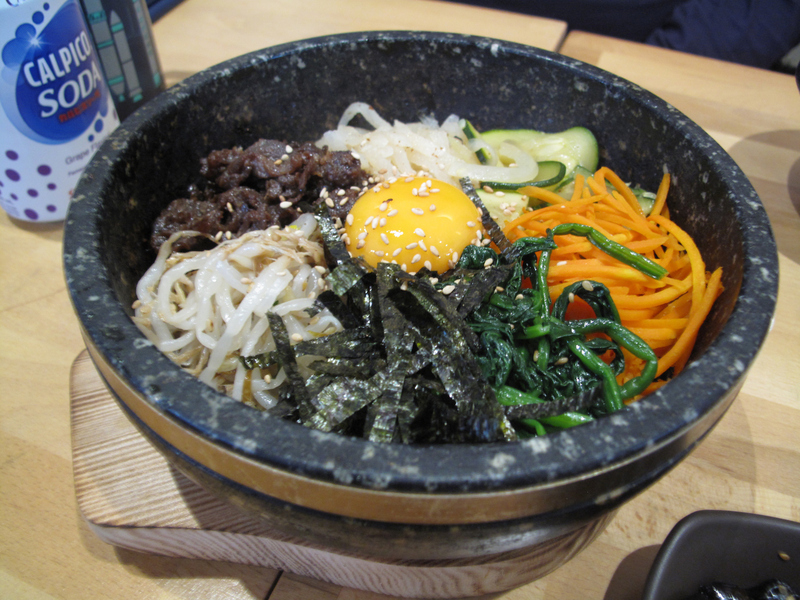 Gary’s stonepot bibimbap with beef ($16) looks just right, all the expected nuts and bolts in lovely, ordered display. Now, $33 may sound a bit steep for what is described as a “whole chicken”. 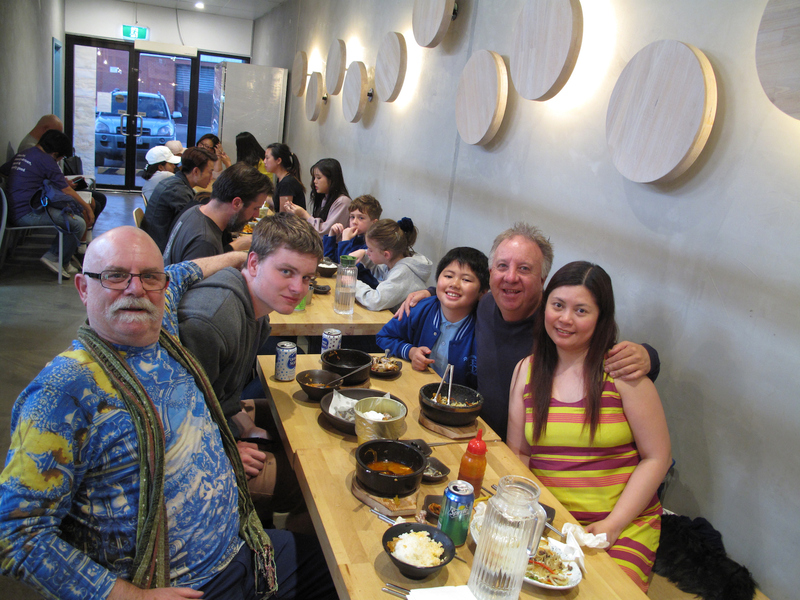 But so many pieces are there, it seems like more than one chook gone into constructing our shared bowl. Certainly, there’s more than enough for us all to enjoy at least a couple of pieces. Bennie later says that he wished we’d gone with one of the flavour coatings – sweet and spicy, sweet soy and cheese snow are available. But as a first-up try at Mumchan, I think we’re all happy with the regular fried chicken. It’s great – and puts the fare served up by many specialist, hipster-style fried chicken places to shame. My own choice of spicy beef soup ($16) is a sensation. Big call: This is the best Korean dish I’ve ever enjoyed. Among the plethora of noodles, egg, mushrooms and mildly spicy broth is plenty of tremendous pork that in barbecue terminology would be referred to as “pulled”. We’ll be back at Mumchan sooner rather than later. After we’ve booked a table. Fantastic! Look at that bibimpap. Cannot wait! Hi Maria! And thanks so much for that! It’s a great place. Yet as soon as most readers see “Laverton” or the like, they ignore it! 🙂 Grrrr!